"The gods are not to be feared!" Equipment: Dandelga- Vargas's sword. Imbued with the power of fire. Heroic Spirit- His presence makes nearby allies stronger. Personality: A energetic and battle ready person. Vargas in an indomitable spirit, never fearing any opponent. He is always training despite his incredible feats of beating the gods with the other five heroes. History: Vargas started out as a Knight in the Agni Empire. Following in his fathers footsteps to become stronger he trained in a special technique using a sword of fire. Eventually he would challenge many strong warriors along the way, growing more and more stronger as he did. Soon the war between the gods began and Vargas took to the front lines and assisted mankind against the Godly threat. He was known to slay many armies of the Gods, and has even killed multiple Gods along with the help of five other people who were known to be the Six Heroes. Unfortunately all Six Heroes were Mortally wounded by a unknown knight and were nearly killed. Many years have passed since then, and the war soon ended. 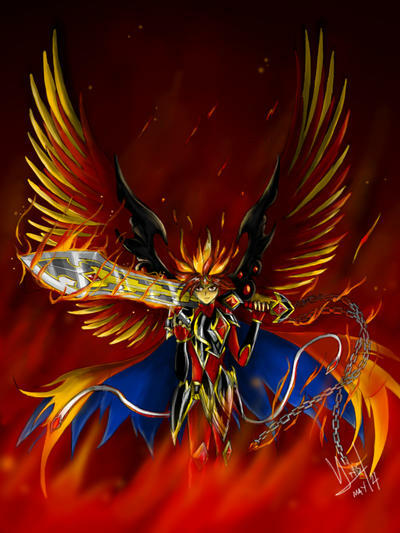 Vargas himself once he was healed, went off to train and defend Grand Gaia from any threat. The Chosen Few would look the new figure up and down. The warrior seemed to run by the theme of the primordial flame, much to the displeasure of Fancy Pants. The sword was a nice touch. There would be a collective mumble that run by the theme of "friend, yeah, definitely friend". "Ur, 'scuse me, but, ur," said Adam, taking a cautious step forward. "Could you direct us to the nearest town?" Behind him, there was the sound of metal slapping flesh from an exasperated Max. "Uh yeah," said Jack, ignoring Max, "we theem to be lotht." The group would follow behind Laadan. The sound of monsters and demons sparked their collective interest. Nevertheless, they need to settle down somewhere before they go any further. "Is this the Grand Gaia you were talking about?" Fancy whispered to the red-bandana'd skeleton, who was vacantly examining the forest. "Oh yeh," said Adam. "John wanted to visit it, to, you know, research it and that. Shame he didn't come, but, then again, we were cleaning up some bodies by Skele Manor." "Oh yeah, we got attacked by bounty hunters when those two girls - you remember me telling you? The warrior-musician wossname, hybrid sisters? - those two girls left for Grand Gaia." But then again, the Imagiverse was growing all the time. He vaguely remembered Jonathan telling him about Ideas, the blueprints of everything in the Imagiverse, that grow until they ripen into whole worlds. That was how places like Toontown and Anti-Earth came around. Grand Gaia must be a very recent world, if they never knew it existed. "Say," said Adam, bursting his thought bubble. "There's a God here? What sort of god is it?" At the news of the nearby god being one of the strongest, Adam would grin, revealing that his front teeth were gone, giving him a buck-toothed look. "Sweeet." Gods were a common part of the Imagiverse. They embody, or control, certain aspects of their daily lives, like the sun rising and setting, death, life, the weather, the list goes on. They are so common, in fact, especially in the Discworld, that it had come to a point when believing in them seemed a waste of effort. It is obvious they exist, and denying their existence brings a sticky end to atheists, so gods are not so much as worshipped as acknowledged. Believing them is much like believing in the milkman. In Grand Gaia, however, they appear to be different. Whilst the other gods in the Imagiverse aren't too bothered with mortals, gods here are savage, bloodthirsty, power-hungry beings, who seemed to have warred against the mortals for maybe centuries. The idea that a god would dislike mortals wasn't new to the Chosen Ones, as apparent in Evil Hand, the God of Fear, and Caedor, the Blood God, but the thought of a group of gods terrorising an entire world was, to put it lightly, a bit intimidating. "Wait a minute," said Fancy, who was considering this currently. "I get that you lot are several steps below the gods in the sense of power, but, hope I don't sound stupid saying this, why do these gods want to kill you?"